to remind one that its fresh young beauty will ever fade." 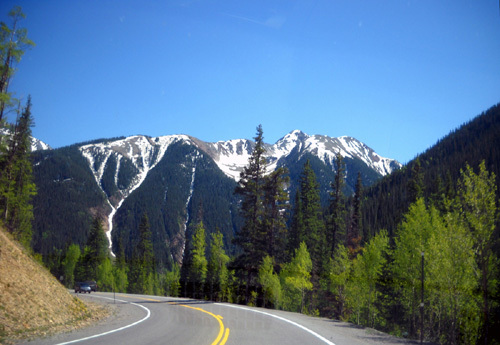 Fresh young beauty is an apt description of late spring/early summer in the San Juan Mountains, at least in the valleys below the snow line. 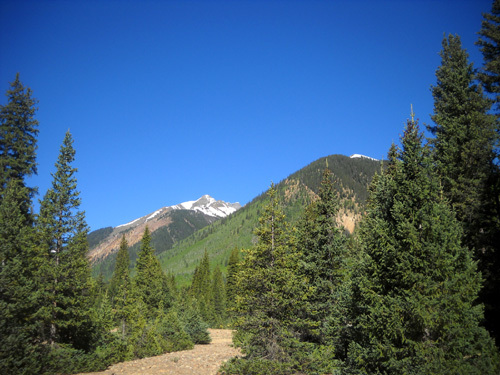 Even at 9,000 feet near Silverton wild grasses are thick and emerald green. 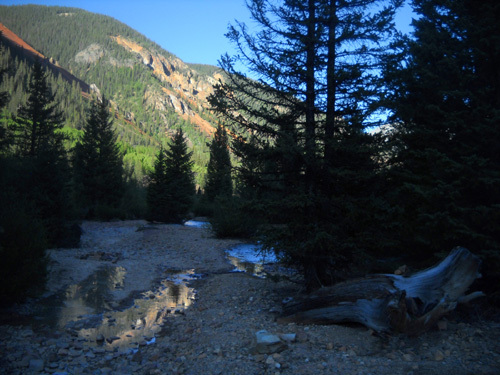 Deciduous shrubs and graceful aspens are covered in new, light green leaves that contrast beautifully with the dark green needles of the pines that cover the mountain slopes. Wildflowers proliferate in a variety of colors. What is really ironic is that much of Colorado is already in a drought -- including this area in the far southwestern part of the state. That, despite all the snow that blanketed the area this winter and early spring. Looking at all the fresh green plant life you'd assume that it's been raining plenty here. It hasn't been. 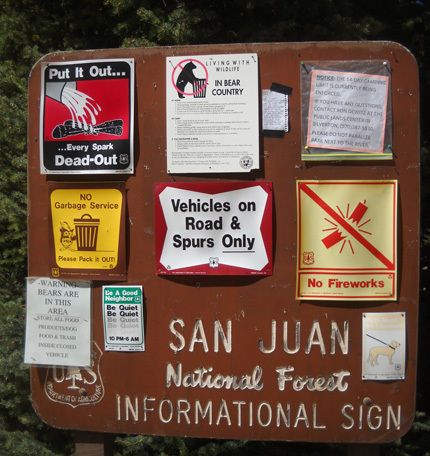 ; the dirt trails and road are very dusty and wildfires are a risk. Jim and I are enjoying the bright sunshine. 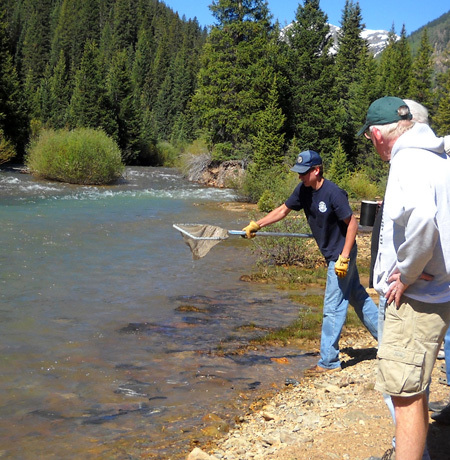 The NOAA forecast is for clear weather in the 70s-80s F. all week in Silverton. It was close to 90 F. in Durango this afternoon while we were there. We aren't acclimated to that! Monsoon season will probably arrive soon, however. Afternoon thunderstorms are common in July and August in Colorado's mountains. That will reduce the risk of wildfires but increase the risk of flooding. 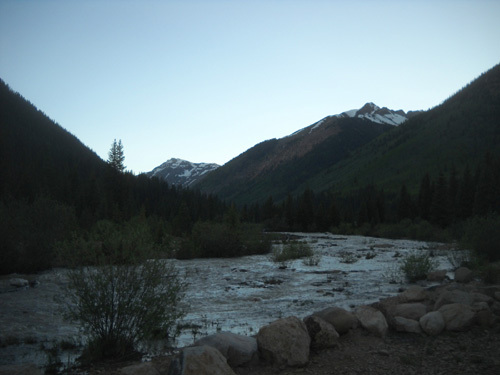 Just as in the Bighorn Mountain Range in Wyoming the streams in the Colorado Rockies are swollen each day, particularly in the evening and overnight when the snowmelt from the high country makes its way to the valleys. We are camped in such a valley, otherwise known as a "gulch" in these parts. Fortunately we're high enough above our creek that we'll get adequate warning if a flood is imminent. There is no dam above us, for example, that could break and wipe out the campground. That has happened in some places; the most recent incident was in Arkansas. 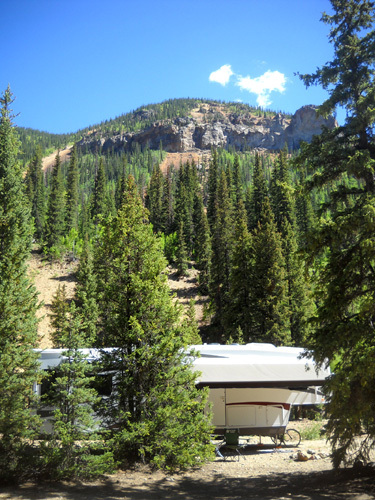 Campsites don't get much better than this. 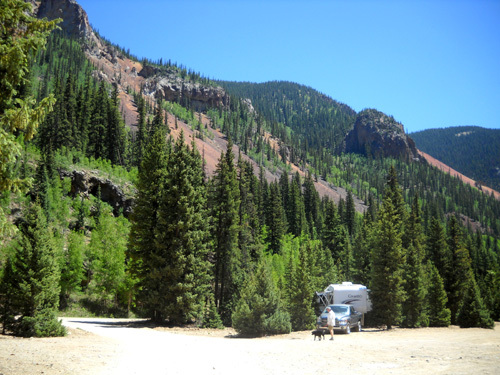 That's just one of many things RVers have to consider when choosing a campsite. 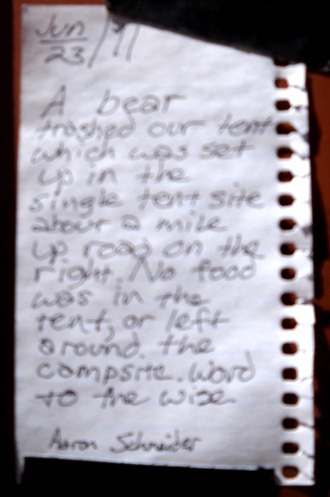 Jim and I have never seen a bear around the Silverton area before -- campground, trails, etc. We'll be more careful this year, especially with Cody. 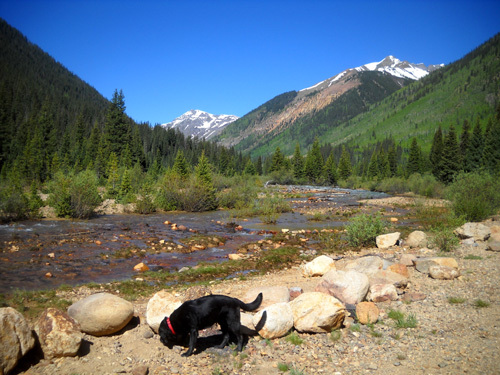 After we filled our Cameo tank with fresh water at the visitor center in Silverton yesterday we drove back north a couple miles on US 550 to FSR 585 along South Mineral Creek and pulled into the first campground, where we have stayed for the past several years. There are additional dispersed sites farther west on this road, and a NFS campground with water and electricity about four miles back. We can't get a phone or internet signal in any of those other places, however. 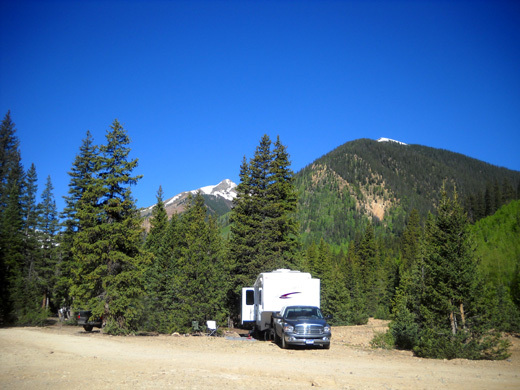 This is our favorite boondocking site in the whole Silverton area. 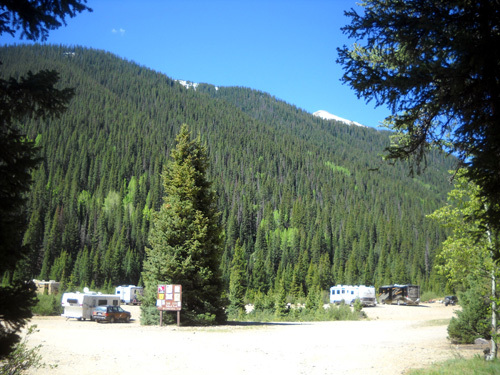 It's one of several free National Forest Service dispersed campgrounds to the NW, S, and SE of town. There are no hookups, no tables or grills, no designated sites. We have a pit toilet that a ranger will sweep occasionally and keep supplied with t.p. -- and that's it. 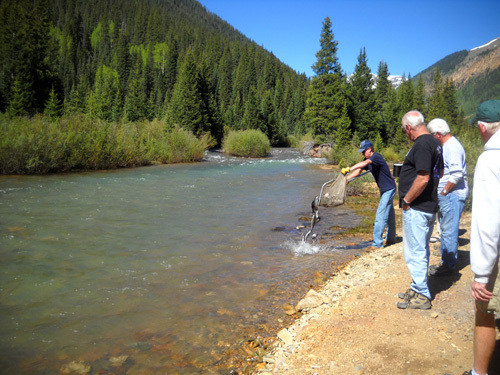 We can get fresh water and dump trash at no cost at the visitor center in town. The city does request a donation for the water. 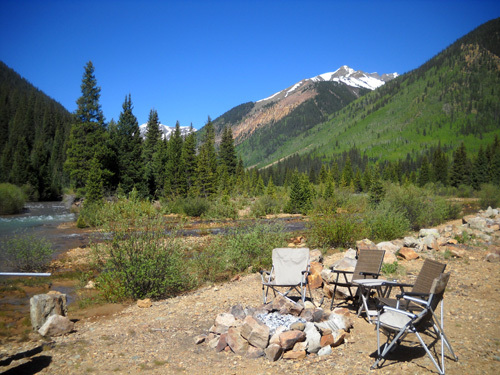 The only dump sites for gray and black water are at the three private RV parks in Silverton and they all cost about $10 to dump. We will do our laundry at the AB RV Park at the far end of town; it is much nicer and less expensive than the private Laundromat on the main street. 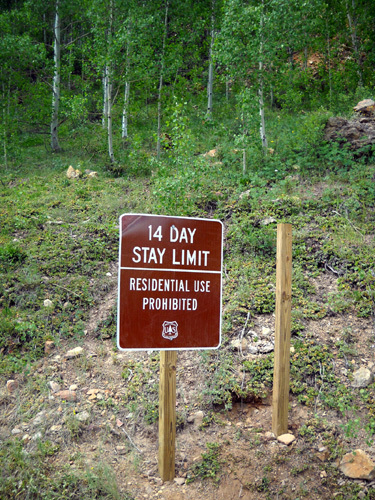 Rangers and/or forest service volunteers walk through the dispersed campgrounds, including this one (especially this one), periodically to make sure folks don't overstay their 14-day limit. Some years that is enforced, some years not so much. In the past we've had no problem remaining in this campground for three weeks before the Hardrock race. The only time it is full is the 4th of July holiday so we make sure we're here well before that to get a suitable site. 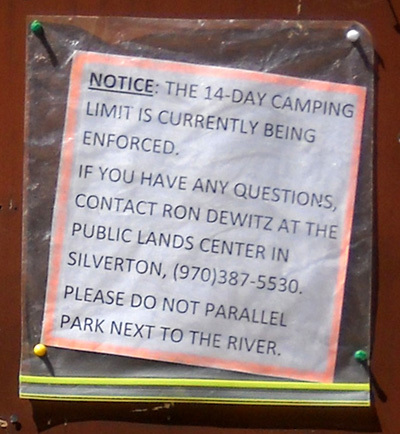 Friends who are here right now say the two-week limit is being enforced more rigorously this year, so we may have to move to another dispersed camping area before the end of our stay in Silverton. The main channel of the creek is out of sight to the left, not this gravel area that is covered now. Several motorhomes and trailers are parked right next to the edge, however, including our ham radio friends, Laura and Roy. They come here every year to ride their Jeep on the mountain roads and work communications during the Hardrock race so they know the risk they're taking. 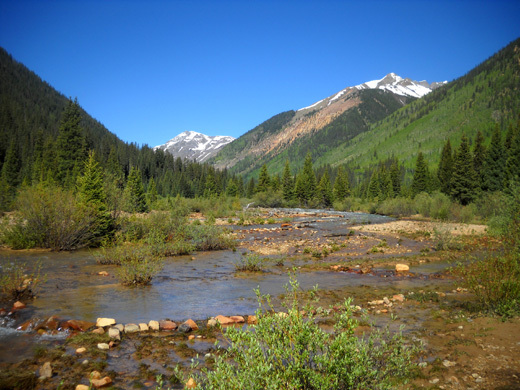 I already mentioned the perfect weather forecast for the next week: sunny and in the upper 70s/low 80s F.
That could mean a bunch of snowmelt and an even higher creek in the next few days. Those folks may have to move their campers to higher ground soon. In fact, some had to move last week. 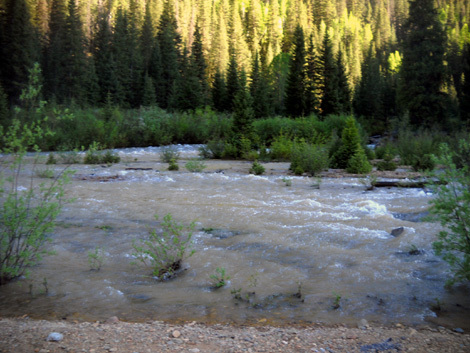 There is water in places in the campground where we've never seen it before. That's enough to discourage us from parking along the creek this year, even though it's the prime location in the campground for the scenery, the white noise of the creek, playing in the water, fishing, etc. It's a hassle to move if we have to, and the large sites on higher ground will be occupied in a few days. 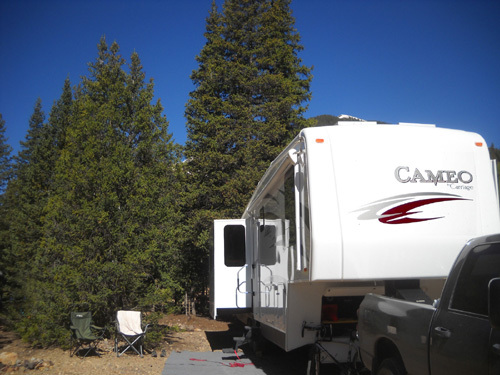 There's another reason we chose another site close to the road the last couple years -- when we've parked our camper next to the creek, folks have filled in too close to us during the 4th of July holiday. We like some space. I'll show you photos of the campground periodically as it fills up. So far we have the "upper tier" mostly to ourselves. It's farther back from the road, better screened from the dust, and has a lot more room. It's still a "onesie," though. There is a small FunFinder trailer about thirty feet away; no one can park on the other side of us. We've had our eye on this site before but it was already occupied when we arrived. Nice view! No one can park on this side us us; boulders block access to this rocky area. The front of our camper faces east. The door side and back of the camper, the sides with all of our large windows, face south and west. Sounds hot, but large pine trees shade the windows. Our solar panels should still receive enough sun from directly overhead to keep the batteries charged up fairly well on clear days. The generator hours are fairly generous here (can run them between 6 AM and 10 PM) so we can use them to run our lights, computers, appliances, etc. if we don't get enough solar power. It helps that we're near the "longest" day of the year right now. Our site looks like the obvious campground host site but we've never seen it used that way since we've been coming here. Barry, the lone male volunteer who comes the closest to being the CG host (he's a volunteer with the NFS), is parked next to Roy and Laura by the river. It'll be interesting to see how many people mistake us for the campground hosts this year. That's a wise move in an unfamiliar campground. They can't really see what's available until they go through that space or even know for certain if there's room to turn around a large rig. Plenty of room to turn or park, unless it's the Fourth of July. We've already seen it happen since we arrived yesterday, and a couple people have asked us about camping here. We let folks know we aren't the hosts, then answer their questions and help them to feel welcome. Jim and I always have fun with this when we're in a "gatekeeper" site and we joke about what we'll do with all the money people want to give us! There is no fee here but it looks like some of the NFS campgrounds that do collect a small fee. 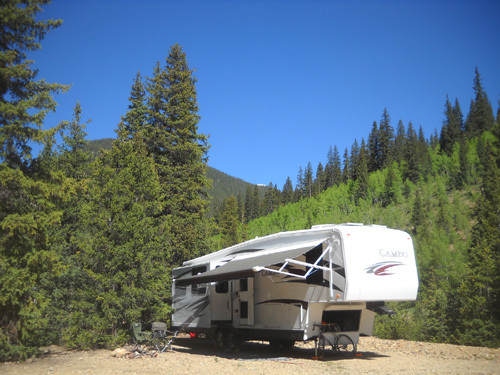 Besides the beauty of the place, its proximity to some great trails, and its convenience to town, we have decent Verizon phone and MiFi (personal internet) reception in this campground. That's important to us. We don't have TV reception with just our camper antenna , however; you need a satellite dish for that and we haven't sprung for one yet. Jim gets bored without TV to watch in the evening so he'll read books and get several NetFlix movies to watch while we're here. 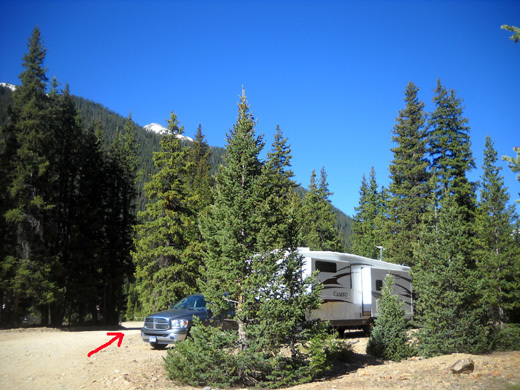 The elevation at our campsite is a little over 9,500 feet. We expect the temperatures at this elevation to range from the low 30s to the 80s F. while we're here. The 14,000+ foot peaks around us could get snow any day of the year. Hopefully they won't this summer; they've still got a bunch left from winter-spring snowfalls that haven't melted. Jim and I wandered over to the creek this morning to catch up with Roy and Laura, friends from California who camp here every summer. They are ham radio operators who have worked the Hardrock race for many years and encouraged us to become part of the communications team a couple years ago. Roy and Laura introduced us to Bob and Lalana, who are from the same town, and Rick and Ellen, full-time RVers since 1998. We'll have to talk to Rick and Ellen lots more -- they've been to Alaska recently. We plan to go there next summer and have a lot more to learn. We watched until they all swam off. No, none of us pulled any of them out of the water! 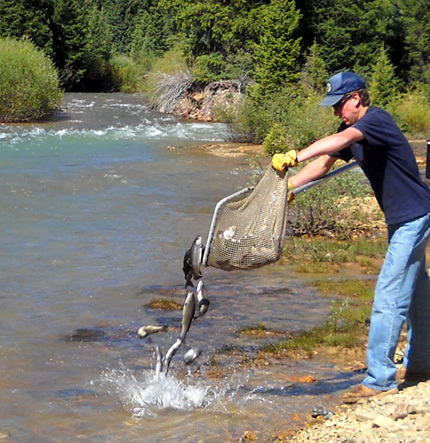 We're glad to be back in the Silverton area. This is another of those places where we feel at home because we've been here so often. We have lots of plans for interesting runs, hikes, and bike rides the next three weeks. We don't know if we'll be able to climb up as high as we have previously but we'll have fun trying. We'll also be helping out for several days with the Hardrock Hundred event again. Stay tuned for lots of photos and stories from one of the best places to vacation in America . . .